Black and gold, black and gold... I'm not sure if any designer does it better then Alexander Wang when it comes to black and gold handbags. Last Christmas I got my first taste of Alexander Wang in my handbag collection, which has left me yearning for more. This year I'm not sure if I can wait until the holidays and I have my eyes and my trigger finger about to buy this bag. So what do you think; Lia, Rockie, Prisma, Emile... what's your favorite? Ok, I'm officially in love with the Lia. Gorgeous! Obsessing over the gold fixtures on the top two bags. Just wow. The Marion is just amazing. I'm in love with the first two! They are the perfect everyday bag. I really like the small Lia....I really want a small cross bdy and this one is so cute! I've always loved the prisma tote but the smaller prisma is amazing too!! 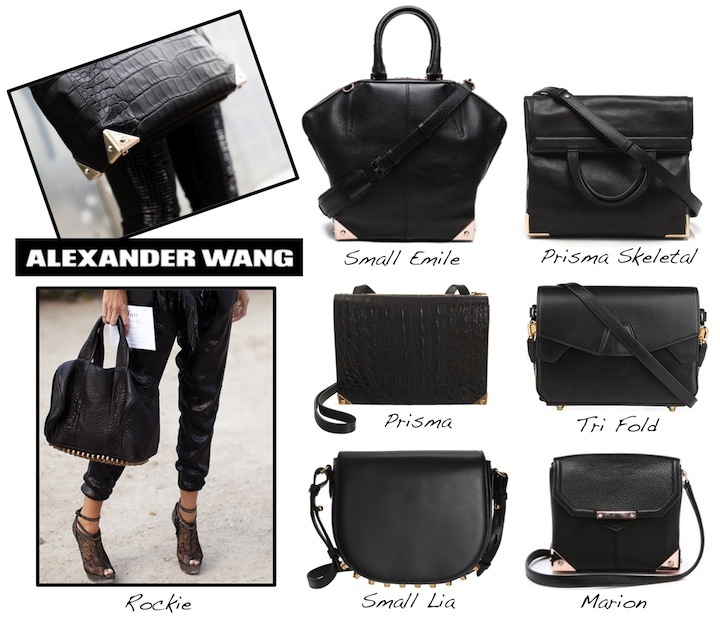 Alexander Wang is always a winner when it comes to bags! hhmmm, I don't know they are all so good! I'm itching to get another Pashli---it happens that way right? ugh, obsessed with A Wang bags. Want them all!